A variety of topics from Brokers To Trades. Wanna know the biggest challenge most new traders are facing? TradeViper’s answer might surprise you! Brokers, ahh yes the subject that brings heart palpitations to new Spot Currency traders. ECM, STP, Bucket Shop, Slippage, FINRA, etc. The list goes on, so lets discuss some of this stuff, but before we do I have a bit of mouth running to do. I have been involved with Spot Currency this since 2004, I have been an introducing broker for 2 different firms, and also have been trading OPM. I was actively engaged as a consultant for the building of a new trading platform, and I had my own live trading internet radio show, by live trading I mean I was trading live with commentary. So I know a lot of behind the scenes and have seen a lot of behind the scenes, some of it cool, some of it not so cool, but all of it done in the chase for Alpha, that elusive Greek alphabet letter. Now if I am mistaken, and you are a verified Analyst/Broker, please feel free to correct me, if not, go away. So with that lets start. This is exactly what dealing desk brokers are, they are small size market makes. By holding units of particular currency crosses, they “make the market” for small size trading. Now think of this, on the NYSE, for years there were “houses” that were Market Makers for different stocks, and guess what, the traders dealing with them would curse the market makers for getting bad fills etc. Now there was manipulation involved at times, and if you knew the trader at the IBM desk, and you called in the trade, you might get a better fill than someone off the street. So there is that, but in general things moved along smoothly. Now that phrase *they assume the risk*_, what does that mean? It means that the MM (market maker) takes the risk off of your head, and what risk is that, the risk that there will be no one out there who wants to buy your 1000 unit ZAR/JPY trade. They provide the liquidity, now obviously they are not a charity so by way of fees and spreads they get paid for this service. The most common type of market maker is a brokerage house that provides purchase and sale solutions for investors in order to keep the financial markets liquid. A market maker can also be an individual intermediary, but due to the size of securities needed to facilitate the volume of purchases and sales, almost all market makers are large institutions. Without liquidity the markets will not move or they will move in such a wild fashion that Gasoline could be 10 dollars a gallon today and 50 cents a gallon tomorrow. In fact, if you have studied for your series 3 you would have learned that the only role a speculator plays in relation to the markets is to provide liquidity. This is why 90 something percent of all futures contracts go undelivered, its all speculation, leading to higher liquidity. So that’s what your market maker / deal desk operator does, provides you with liquidity. Now here comes the bad and ugly, Some Dealers in the US have been caught slipping etc. Their customers complained to the NFA and the NFA fined them, if you want to take a look here is the linky - https://www.nfa.futures.org, now with that said some of this went on like 10 yrs ago, so a clear caveat there. As far as some offshore brokers in Utopia Planitia, well I don’t see how you could even start proceedings, or who you would complain to, “in fact it’s cold as hell”. In the UK and Canada, good governance, other places maybe not so much. So dear reader Caveat Emptor, due diligence and all that. I will tell you this your broker has to be reliable, it is hard to go against the markets and your broker at the same time. In 1967 Andy Granatelli entered a turbine powered Indy car that was sponsored by the STP company. Alas this grand experiment ended in failure due to a failed transmission bearing. So what does this have to do with trading and Brokers??? Well absolutely nothing, other than the acronym STP. Well, ummm that’s not it. How “bout this from FXPRO uk, a registered and regulated broker in the U.K.
Straight-through processing is a method of processing Forex trades which routes them straight through a broker’s servers and on to liquidity providers without having to be re-entered, and without intervention from a dealing desk. Straight-through processing shortens trade execution time and ensures that traders receive a better price. It also reduces slippage and re-quotes”. Yeah that’s more like it. But what does this really mean ??? Well let’s look at the positive knowns. The price you see is the price you get. sense, don’t really have to take the spread into consideration. Well, that’s about it, STP was the gold standard, the crème de la crème, and everyone who trades on this platform will be WINNERS wooo hoooo. Weeeeellllllll hold on there pardner. Now the negative Knowns and Unknowns. no one listens, but there you are. platforms, the broker can see your stops, entries and tp, if they are preset. is a normal function of the market. So that is it, I will tell you that despite some of the shenanigans, FOREX is the only financial product that will allow you to start with $500.00, and then trade size small enough to where you can actually learn how to trade. So on Monday it is back to work. I wanted to show what I look at the start of every week. 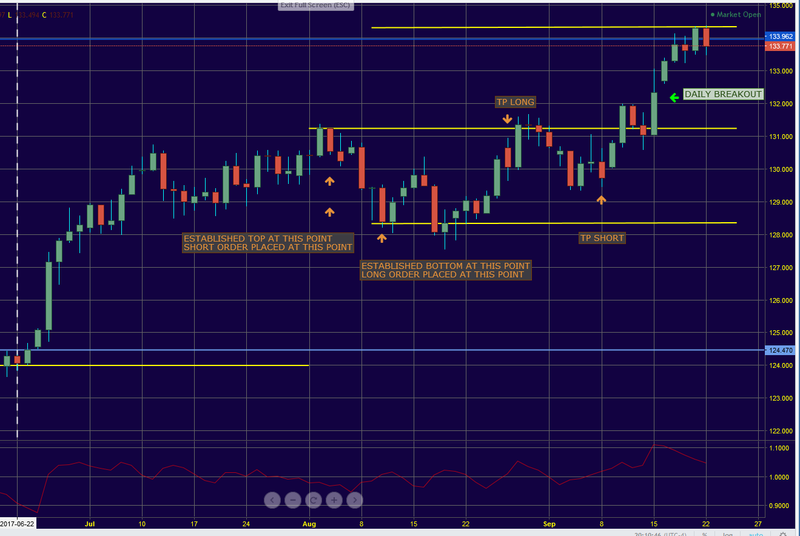 Please ignore the gaps, I am using forex.coms web trader as an example here. 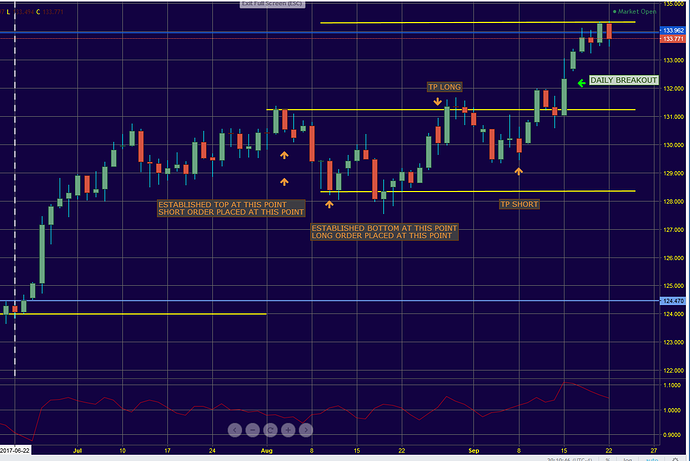 I have left labels on the charts to show what all the levels mean, I don’t have them on my trading charts. Obviously this is the daily, I will use the daily high for the top, lined up with the last high. Also daily, starting the count from the beginning of the year. I also have the mean, which was, strangely enough closer to the daily high of like May - July. Interesting how that worked out at this point, I think it’s just coincidence, but who knows. 4 Hour, on the bottom we have two bottoms that are too close to call, so I split the difference, you can also see when I started the count for this, or period if you like. Also the secondary top is an interesting feature. Notice we continue to use the Daily top, and a 4hr mean included. I think for us the price mean from breakout is the most interesting feature of the 1hr. That would be from the start of the breakout, at the 4hr secondary top, to the 1hr top, then calculating the mean. This is the 15min chart, or my Trading chart, I then use 5 min for entries. Notice how price is floating around that breakout mean, also notice this ancient pattern of the EMAs getting bunched up, and squeezed together, just before a breakout. All in all, I will be looking for long entries. We think that if one was to long term this, lets say more than a day, you might be looking at 131.967 as a minimum stop level. As always this is not a trading or investing reccomendation, and is for education only, if you wish to trade or invest talk to your financial planner/broker first. Thanks a lot! Great Strategy. split ATR into 3 segment, if atr at top segment, look to buy and vice versa. After price pullback, wait for opportunity to enter trade. Wait for ema to Squeeze, when price breakout above previous breakout swing mean level, we pull the trigger. Look for daily chart, if no signal, look for 4hour chart, if no signal, look for 1hours chart, if no signal, look for 15min chart, if no signal look for 5min or 1min chart. If this currency pair no signal, we search for other currency pair and look for signal. Just one question, i need to know why you use ema24, ema48 & ema72. I would appreciate it very much. Otherwise, i will die of curiosity or end up searching for a reason when there isn’t one to find in the 1st place. And correct my summary, if there is any part wrong with it. Thanks a lot. I appreciate it very much. Its my wish to become a professional trader one day and make a living Trading forex. I’m still working very hard towards my goal. Hey alph, a couple of things. Thank you for showing appreciation for this post, it means a lot. Also you got more out of these than I thought was there. I see most of this stuff in my head, so sometimes when I draw it out, there is more there than I realize, I guess what I do sometimes can be called intuition. The EMA’s really only apply to the 1 hour, they represent 24 hrs, 48 hrs and 72 hrs. My statistics show that for my form of trading, using these timeframes works best. So you were right about the EMA’s, looking for a tightening, it’s like compressing an unbreakable spring, either the top of what is compressing it will eventually fatigue and break (long) or the bottom (short) will, and whichever side breaks, the spring will push through. On the Euppy our statistics show, that in general, it does not really respect these EMAs as “levels”, so we use them to illustrate a building of momentum or pressure over these particular periods. The ATR I originally had on the charts is the standard length, I actually use 8 ppd, on a one hour chart. We don’t use it on the shorter time-frames. You can sub divide it, or use it plain. There are things that I look for that can help become more efficient. But first, I used to slam ATR, simply because no one I knew was using it, so I figured “no one” was using it. Boy was I wrong, and some folks I met hammered me about it. So as far as the ATR, I repent in sackcloth and ashes. So the useful ATR, can help you detect momentum, and I will add that the most productive trades we have taken, are with the ATR on an upward movement. Obviously the ATR is not a directional indicator but can be used as a momentum indicator, So if you can take a trade with the ATR moving higher, you are far better than not. Also it can be used in the 8 period on the 1 hour, as a guide as far as how much movement you might get for a TP and for a STOP. This you can easily figure out by looking at the movement and playing with the math. Also if you have ever wondered when to get out, look at the run up of the Euppy, on a 1hr chart between 9/14/17 22:00:00 and 9/15/17 5:00:00, then look at the 9/15/17 6:00:00, look at the price then look at the divergence between the rise in price and the downward move of the ATR, time to head for the exit on this one. The levels are self explanatory. 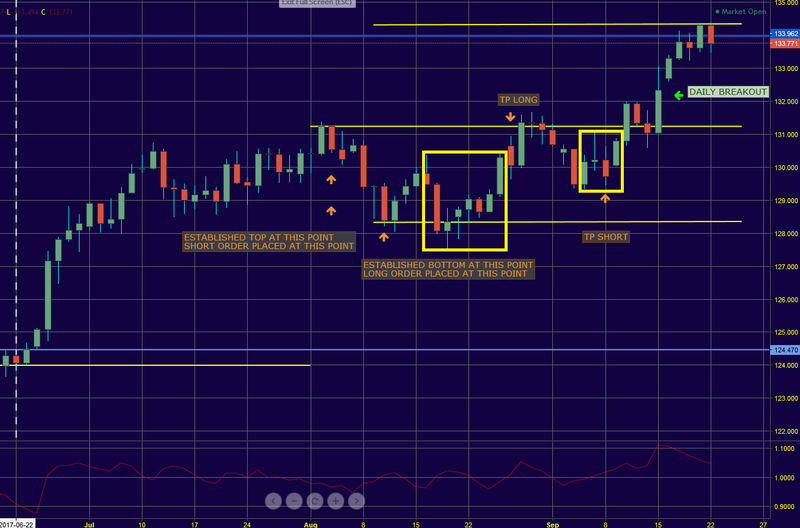 Please remember this is not a system, I use this to get part of the context of a trade. The other part has to do with basic fundamentals, knowiing what is going on in the world, more or less. I start work tomorrow, so my replies might take a bit longer, so please be patient. i’m glad you replied. I realised my understanding of ATR is wrong. So ATR is kind of like the ADX i’m using. I understand now. SO conclusion is when ema don’t squeeze. We wait (peace before the storm). Once ema squeezED. Break out imminent. I activate standby mode. Upon breakout, i squeeze the trigger. I have one question. Sometime, there is whipsaw. Do you have any way to prevent or minimize that? Or is it a risk everyone have to face? Hey Alph, yes it called a STOP, hehehehe. But seriously, it is a stop. If you are trading in the direction of the trend, it minimizes the whipsaws. Also, I have seasonality theories, and frankly, this helps me stay out of a whippy market. Exactly my own approach, which has served well for 10’s of years and was developed during my years working in a bank trading room. I use a closer set of EMAs but the same process of compression and expansion (or sometimes explosion!). Hey M, it’s funny, this kind of trading has been around since drawing an MA on a paper chart. I remember back in the Day, the Bald Eagle of VIPER couch fame, was trying to get a gig with Pristine Trading, and he was telling me about their “unique” way of trading, IE the tightening of multiple MA’s, looking at the angle of an MA and then grading it’s “quality” as far as movement is concerned by the angle, steeper the angle, better the grade. I had to hold back a chuckle, this stuff was older than dirt, but they were packaging it as “New and Improved”. Reminds me of Mikey. Thats why I tell everyone, I am not using anything unique, or packaging it in a unique way, it’s plain, old school trading. Buy the way cheated a bit last night, took a long on the Euppy, at about 8pm , which means I took it “out of season” please don’t tell fish and game. Also the ATR was moving down, so mo still was out of the building. I got up around 12 to drink some water, and I did not like the action, so I closed it, up 15 pips. I was looking for 32, but I got the late night bugaboos. Basically we are talking about a slow upward drift, and from where I entered, had I left it, 32 would have been well within reach. Anyway, got the first trade of the year under the belt, and hanging the first pelt on the lodge pole. Exactly, that was also why I said “developed” and not “invented”! But it is also funny how fashions apply in tech analysis as much as elsewhere. MA bands/ribbons/rainbows/guppies etc are all variations on the same concept, which has been around for “ever”, and stood the test of time, and yet are simply dismissed nowadays as “lagging and therefore useless”. PA is the modern theme, and all that anyone seems to react to - and yet drawing pencil lines for trends and S/R is perhaps as old as trading itself. The reason why MAs work is because they respond to, and reflect, price direction in its continuation, reversal and speed. The only development work is what choice of MAs suits one’s aims and using some brains to put them in context with market conditions in general. MA’s might not be the flavour of the day right now among the fashion-conscious newbies, but sometimes an old pair of wellies is more productive than a pair of Lexys specials, no matter how superb they look! So I continually run at the mouth about context, so let me show some of my basic looks. The comments are under the image, I kinda think this works out better. Oh don’t mind the “gaps” this is forex.coms webtrading platform and not institutional. So here we see the weekly, notice the high, 11 2014, and the low 7 2016, also look at the mean, and how price consolidated around the mean 7 2017 - 9 2017. This was predictive, and there is no mumbo jumbo about this. It is simple, these two levels are on the traders minds, so, where does it settle, right in the middle, it’s the ole “price reverting to the mean from an extreme” although in this case it was more of a pause. If you look at the Bottom, purple dashed and then you look at the two Blue Dashed lines, the upper one is the first level on the way back up, if we had looked at this in Dec 2016, we would have seen how close price was to the mean of 149.37 and 110.849, at 125.40ish. Even though price did not hit the mean exactly, it came close and consolidated twice. The drop in April was fundamental/news/announcement driven, and, overall was short lived. I can’t hold through stuff like that, but there are some successful people here who can. I use these longer charts to set my bias for 5 min to maybe 4-5 hour trades. Like I said, I am inefficient, dirty, and at times a bit chaotic, but I make up for it in positive returns. Now lets look at some more features of this weekly thing. So by the end of the week of 7/16/17 we should have known that we have moved from a trend to a range. And yet I remember hearing traders whining about “aaahhhhhh this market is crazy, irrational, I’m losing money, etc”, well if you would have looked at the right chart, you would have seen it is ranging, which means a different skill set, and trading plan, or, just stay out till it starts trending again. So it looks like we have started on a new leg up, so this upcoming week, I will be looking for long, in general. If you look at the bars and their size, you can see a big difference from last week to this. This may be significant going forward, so it is something to keep an eye on. Next post, will be the Daily, be there or be square. I would like to offer a different perspective. 2015 April was 2015 year LOW at 126.087. 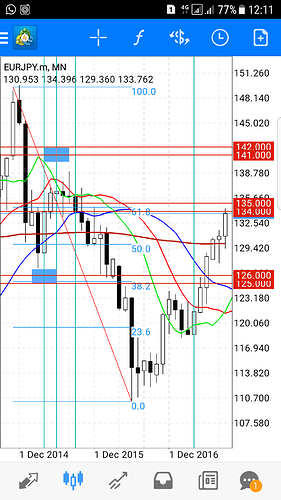 Fibo 38.2% level is one zone lower between 125 - 126 Significant support zone at 125-126 level. 2015 June was the immediate Swing High (141.048) from year 2015 - 2017. 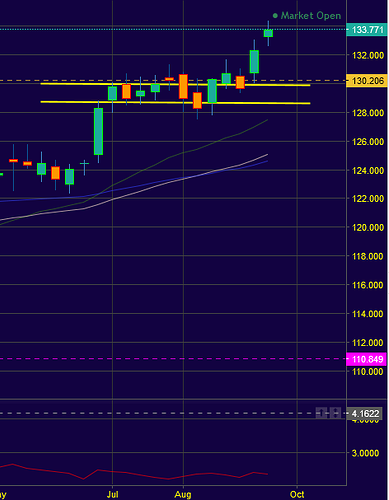 IMHO a significant resistance zone level stand at 141 - 142. 2015 September, Alligator Moving averages line squeeze was the tighest. Coincidentally squeezing Fibo 61.8% zone level as well. 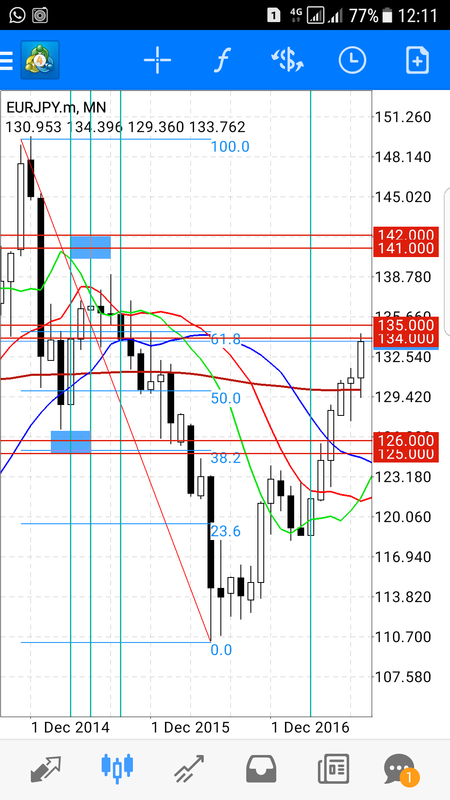 Fibo 61.8% zone level (134 - 135) is also the current immediate resistance zone level. From 2017 april, we have the 1st bullish candlestick and the bullish rampage was relentless. To date there is 6 monthly closed up candlestick. Which is rare i must say. If you look back across the monthly chart by eyeballing, 6 bull candlestick is a rarity. Current september monthly close is still below Fibo 61.8% zone level, which is below 134. If by end of september 135 level is not breach. 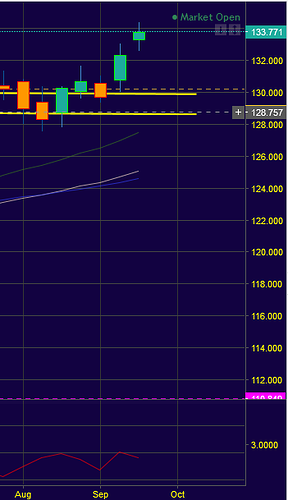 I would favor a bearish bias for EURJPY for the month of October. 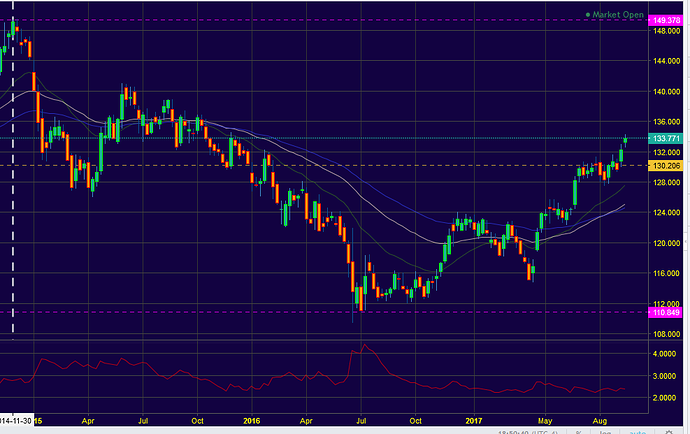 Conversely, if 135 level were to be breached. I believe there is no major resistance preventing price from testing Immediate Swing high level at 141. Please give a like if you find my Technical Analysis interesting. Most people seem to believe that the longer the TF the more accurate the signals and the longer the moves - and the wide the required stop levels. I sometimes relfect on this and wonder do we spend an absolutely disproportional amount of time on just stalking our near term entry levels and entering and exiting trades, hoping to, on balance, make a few bucks more than we lose? Maybe it takes the proverbial 5/6 years to become profitable simply because we are entirely focused on when to dive in instead of when when to stay out! Is learning the art of sitting on one’s fingers a lost skill from the dark ages of paper charts and telephoning orders. The weekly/daily charts provide such beautiful patterns and are so easy to trade retrospectively from the armchair by just scriolling back through the charts - by in real life? in real time? And then when the moment comes, plunge in with …errrr…with what! hmmmm how much can I risk on such a long term trade. Its a long stop. My R:R only allows me …what?..one microlot? Haha, oh well, here goes! Scroll ahead three weeks…Hoorah! 300 pips profit! Yes! that’s an average of 100 pips per week! Wow, I am a real TRADER!!! So what have I earned in real money…hmmmm. Traders need to, guess what…trade!!! It is what adrenalin is for! So the art becomes reading the jungle on the long term charts, locate the likely locations of the beast, Lie in wait on your short term charts, wait, wait, wait, wait. And there it is! Its on the run! Go for it, a short chase and a victory. Patience patience and more patience - and then the chase. So, on with the daily, remember please, that all of this work, is for the purpose of plotting out my weekly trades, not weekly in length, but short intraday trades, in and out, then on to the next one. Here we have that nasty range consolidation, well nasty for range traders, but for the Wiley old Viper, a thing of beauty. This is why we have to be adaptable, a range like this will chop a range trader to pieces, unless you are someone who never uses stops, yeah that guy, anyway Monday, starts another day. Can I play spot the box??? So here is the last one before Monday, yup one hour, please take note of the Mean. Highs, Lows, and Means, so let’s look. So there you have it, we will be paying attention to follow through tomorrow PM, and looking for positions Monday AM. Ha, you are half way around the world, and trade so close to what I am doing. So cool, and amazing. Box trading, a fine concept if I ever heard one.